All ILS dental delivery systems are designed and engineered for years of trouble free performance, our automatic controls isolate water from the main block for improved reliability. Every ILS control features individual air and water controls, smooth lines for ease of cleaning, wet/dry foot controls, air and water filters with regulators. 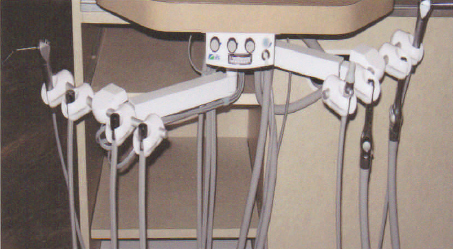 Many options can also be incorporated such as fiber optics, scalers and electric handpiece motors. As with all ILS products quality and durability is our number one concern. The ILS left/right delivery system features a streamline asepsis design that can easily be converted from a left handed to a right handed operator. The instrument holders have been engineered to pivot as well as telescope in and out for a greater range of motion and ease of positioning. Our under counter mount unit is a versatile fixed position dental delivery systems designed to be mounted under almost any work surface. The unit includes 3 automatic handpiece positions and a 3 way syringe on the operator side, HVE, LVE and 3 way syringe on the assistance side. The side delivery unit combines simplicity of design with stylish aesthetics. The ILS side delivery unit is a step above other value dental delivery systems. With designated compartments for high tech devices this unit can expand and grow with your practice.